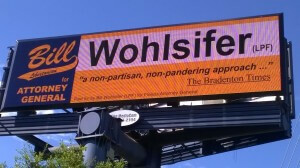 A billboard from Bill Wohlsifer’s 2014 campaign for Attorney General. Intellectual property refers to a right of ownership that can be protected under state and federal law, including original works, ideas, discoveries, and inventions. Such property includes books, artwork, sound and video recordings, computer software, other copyrightable images, trademarks, trade secrets, and computer software. Some less obvious forms of intellectual property include carpet patterns, PowerPoint presentations, blueprints, customer lists, live broadcasts, and website content. William R. Wohlsifer, PA’s intellectual property transactional practice encompasses copyright and trademark registration, confidentiality agreements, negotiation and drafting of licensing and royalty agreements, and joint development and commercialization agreements. William R. Wohlsifer, PA’s intellectual property litigation practice includes prosecuting or defending copyright and trademark infringement cases, trade dress cases, Internet and technology disputes, counterfeiting, appropriation, and unfair competition claims concerning our clients’ intellectual property rights, including obtaining and defending against temporary restraining orders, cease and desist actions, DMCA Takedown Notice and permanent injunctions. The firm also counsels on licensing, marketing, distribution and other commercial transactions regarding products, services and technologies protectable under international, federal, and state intellectual property laws. TO DISCUSS PROTECTION OF YOUR INTELLECTUAL PROPERTY RIGHTS.